KABUL, Afghanistan (CNN) -- The number of civilians killed in armed conflict in Afghanistan rose 40 percent last year, to a record 2,118, a U.N. report said Tuesday. 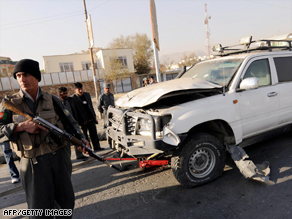 Afghan police at the site of a deadly suicide attack in Kabul last November. Militants were responsible for 55 percent of the deaths, but an additional 39 percent of the victims were killed by coalition and Afghan forces, said the report by the U.N. Assistance Mission in Afghanistan. "This disquieting pattern demands that the parties to the conflict take all necessary measures to avoid the killing of civilians," it said. The report, compiled by the mission's Human Rights Unit, used independent monitors who investigated incidents that killed or injured civilians in conflict zones. Insurgents killed 1,160 civilians. Most died as a result of suicide-bombings or roadside blasts in crowded areas. The majority of the casualties took place in the south of the country, which saw heavy fighting in several provinces. Afghan security forces, U.S. and NATO troops killed 828 civilians. Airstrikes -- many at night -- were responsible for the largest percentage of these fatalities. The remaining 130 deaths could not be accounted for because of issues such as crossfire. The victims included 38 aid workers, double the number for 2007. An additional 147 were abducted. The U.N. report adds to the bleak picture painted in U.S. and coalition military documents that CNN obtained earlier this month. Those documents showed that overall attacks by Taliban and al Qaeda forces across the country increased 31 percent last year. The documents also showed an increase in civilian deaths. The issue has become a political hot button for President Hamid Karzai, who is up for re-election this year. Trying to appease his constituency, he has railed against the United States for air and ground attacks in which women and children have been killed. The United States has tried to reduce those numbers by changing approaches, such as not bombing suspect cars as they approach crowded areas or waiving off an attack if there are innocent civilians inside a house, according to U.S. military officials.